Alright, it’s 11:15 p.m., the Dodgers just reduced their Magic Number to 5, and I’m not quite tired yet. So here we go. As promised, we spent the morning at South Coast Plaza to buy Tony a toy for completing the school week on a positive note. In particular, we went to a store called Puzzle Zoo (note: lame website) which carries a wide variety of unusual toys and collectibles. Being located in SCP, it’s not surprising that many of their items are what I’d consider pretty expensive. 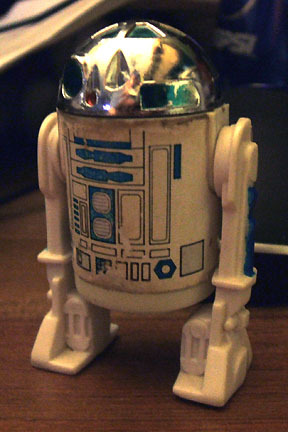 That did not stop me, however, from buying a vintage R2-D2 Star Wars action figure (see inset) for a mere $5.95. The place has three buckets filled with used figures, most of which are in poor condition and all missing weapons. The ones in better condition and with full accessories (or NRFB for you collector dorks) are in a display case and, needless to say, are not $5.95. Either way, I’m happy to be able to have a slice of my youth staring back at me while I write this. I may go back for more sometime. Anyway, visiting SCP is always a trip. On one hand, you have a very upscale mall with ritzy merchandise: Cartier, Rolex, Versace, Tiffany & Co., etc. I almost feel like I’m walking through a Beverly Hills shopping center at times. Then I go outside and realize how wrong I was. Despite its upscale retailers, the mall is located in Costa Mesa which isn’t exactly the neighborhood you’ll see on The Real Housewives of Orange County. In fact, those people couldn’t survive living in Costa Mesa unless Spanish was their collective second language. A short drive up Bristol Street is far cry from the sparkling watches on display at the Rolex store. The glitz and glamor or the mall is replaced with pupuserias, Targets, and 1988 Nissan Stanzas held together with bubble gum and duct tape. Instead of seeing the well-dressed carrying shopping bags, you’ll see homeless pushing their lives around in shopping carts. Orange County isn’t exactly how it’s portrayed on the idiot box, believe me. Either way, we accomplished what we set out to do and I took a few pictures as well. In fact I uploaded a fresh batch of phone-cam images to my Flickr account, including the ones taken today. Also in the set are some other interesting shots taken over the last few weeks, so go ahead and check them out! There are some pretty crazy things in that set and each has a full description. Feel free to comment on them as well. Well, it’s now almost midnight and I’m now getting tired. See ya!